Our website has been the same since 2008. The server space has been donated by National Automotive Lines for the past 11 years. It is time to say goodbye to this old WordPress site. In January 2019 we will be launching our new website! This will be much easier and friendlier. How can a website not be friendly? Have you every tried our current site on your phone? It doesn’t work well. The new site is customized for the viewing platform. All the content of this site will be on the new site. Take a look at the old site as you will soon see a change. This is the last week for the Shelby County Players’ performance of ONE FLEW OVER THE CUCKOO’S NEST. Performances are tonight (Friday) and Saturday at 7:30pm. The final performance of the run will be Sunday October 7th at 2pm. We hope to see you at one of these performances. You will be glad you attended! On Monday night October 8th the J. KENNETH SELF BOYS & GIRLS CLUB will be holding its 2018 football awards program at the Strand. This year’s event will be recognizing 113 players and 55 adult coaches and volunteers from the 2018 program. Six teams ranging from grades Kindergarten through 6 competed against other travel programs from central Indiana, playing 41 games over the course of a three-month period. Awards will be presented to each grade’s Outstanding Offensive Player, Defensive Player, Most Improved and Mental Attitude. This was the Boys & Girls Club’s 30th season providing youth football for the Shelbyville community. The event is free and starts at 6:30pm. Across the parking lot, GIRLS INC will be presenting at our October Community Treasure Series Lecture on Wednesday October 10th. The program starts at 7pm and is free. We finish out the week with a private event on Friday and BOB ZANY on Saturday October 13th. In 1977, at the tender age of fifteen, BOB ZANY on the infamous Gong Show. Halfway through his stand-up routine, which he read from a piece of paper, he was pulled off the stage by a man dressed like a nun wielding a net. Eleven years later, he made a triumphant return as a celebrity judge. Undaunted, he talked the owner into letting him produce his own show so he could have the stage time, and for the owner, an audience. The result was The Bob Zany Show featuring such newcomers as Garry Shandling, Yakov Smirnoff, Robert Wuhl, Kevin Nealon, and Nia Peeples. After one show, Bob was approached by Frazier Smith, the host of a top-rated radio show on KLOS/LA. After a short time doing guest spots on Frazier’s show, Zany was hired by KLOS as a personality with his own show on Saturday mornings. Other accomplishments include the creation of Bob Zany’s Comedy Outlets, with over 50 locations throughout California and Nevada; a comedy album “Hi Home, I’m Honey”, on Laff Records; a soon-to-be published diet scrapbook, “Laugh at Fat, Bay-bee!”, and the highlight of his career to date, being hired by his idol, Steve Martin, to appear on George Burns’ Comedy Week. The Strand and community lost a wonderful supporter. William “Bill” English passed away this week. Bill and Carolyn English were staunch supporters and consistent patrons in the early years of the Strand. They provided us with needed words of encouragement, patronage at our events, and support in many other ways. The Strand sends our condolences to Bill’s family. This week we booked another October event. On Sunday, yes Sunday, October 21st comedian SAMUEL J. COMROE will perform at the Strand. Tickets are only available online or at the door. Samuel J. Comroe, a Los Angeles native, is a stand-up comedian who performs at over 100 clubs and colleges annually. He made his TV debut on TBS’ Conan, BET’s Real Husbands of Hollywood with Kevin Hart and he’s a contestant on the current season of America’s Got Talent.. In addition to his TV appearances Sam was recently featured on All Def Digital’s Comedy Originals. He is also the winner of Ricky Gervais’ Comedy Competition, The San Francisco Comedy Competition, and has over 40,000 subscribers on his Youtube Channel. His comedy is made up of the trials and tribulations of living with Tourette’s Syndrome since being diagnosed at age six and observational material based on his life experiences. The performance starts at 7:00pm. TERRY LEE and the ROCKABOOGIE BAND tickets are now available! You can get yours at Mickey’s T-Mart (cash or check only) or online at BrownPaperTickets.com. The concert is Saturday October 20th at 7:30pm. We are looking forward to our October events. Take a look at the list to your left. Please note the Shelby County Arts Fest Choir Concert has moved to October 25th. This email is being written early in the week. We have been told by the contractor that the road work in front of the Strand should be done shortly! We met to discuss parking spaces, and our loading zone is being striped preciscely in front of our marquee. We look forward to the completion of this project. While we have reservations on the design done by INDOT, we are extremely pleased with the contractor Milestone Construction on how they communicated and dealt with the Strand. We are always consulted and in the loop. Although it was tough, we knew they were doing their best for us. Thank you to the construction superintendent Kyle for all he has done for the Strand and our neighbors. We have 15 events this month! We have already hosted 96 events in 2018. Our volunteers are busy. This is because we believe that a great community deserves a great performance venue. This is because of you, thank you! See you at the Strand. This past week we had our rescheduled Friday Night Frights. Sure enough, our fans from Muncie made the drive down, again, to see DEEP RED. We appreciate their (and your) loyalty. We followed the showing with Saturday’s concert by Kit Haymond and PRESSED IN BLACK. Kit was joined by Trent Moss and the FAIRLAND RAMBLERS. Trent did a great first set. It was clean and sharp. Trent is a fine guitar player and singer and has assembled a dynomite group. Kit played the second set with PRESSED IN BLACK. He started with three new songs. Each was catchy, interesting, and all were good tunes. He proceeded to fill the evening with fantastic music from the Strand’s stage. Kit has grown musically since his last concert. We are looking forward to his next concert! This holiday weekend we took a break. We had an opportunity for a last minute booking on Sunday September 2nd, but being an all volunteer organization we did have the volunteers necessary to hold the concert. As an organization, the Strand is trying to work as far into the future on bookings as possible. There are many details that are required for each and every show. We had a cancellation for this weekend, so we are dark. We are back on September 12th with our Community Treasure Series. This month the BOY SCOUTS will present about their dynamic and changing organization. We are fortunate to have several Eagle Scouts as volunteers through the years! The lecture starts at 7pm and is free. 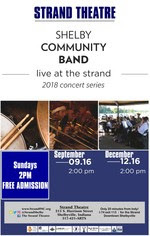 The Shelby Community Band returns on Sunday September 16th with DANCING AT THE STRAND. The concert is free and starts at 2pm. We continue on Friday September 21st with Friday Night Frights. This month we are showing the 1965 classic BLOODY PIT OF HORROR. September 22nd the Strand will host a rock concert on Saturday night by COLLY. This group from Cincinnati is on a midwest tour and we are pleased to welcome them to the Strand. Cincinnati’s Colly nimbly balance robust song craft and electronic pop ambition, maintaining the perfect push-and-pull among seemingly opposite ends of the spectrum. (Think The 1975 producing Kings of Leon, and you’re halfway there) Formed in 2017, the quintet quietly drummed up a buzz with early acclaim from Alternative Press, Substream Magazine and more in addition to attracting a growing fan base fueled by marathon touring. The groups forthcoming full length debut, I Can’t Sleep at Night [Paid Vacation Records] will illuminate their intimate, idiosyncratic, and infectious style. 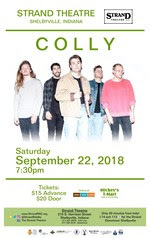 Join Colly at the Strand Theatre on Saturday, September 22nd as part of their nationwide tour following their recent release of “Shelter Me”. The Strand is scheduling safety training to reinforce and expand our safe operational practices. We will be focusing on how we deal with heights, ladders, and scaffolding. We will require all groups who use the Strand to adhere to our safety standards. It only takes a second to have a problem. We need to do everything we can to mitigate the chance of an injury at the Strand. We have asked several local businesses to share their safety practices and trainers with us. These businesses have all stepped up and are helping the Strand remain as safe as we are entertaining. Tonight is FIRST FRIDAYS downtown. The theme for September is the Arts. Many of our friends and performers will be downtown. We hope you will all visit the activities and fun tonight. We are dark, so our volunteers can check it out too! BOB ZANY brings his funny brand of comedy to the Strand on Saturday October 13, 2018. Bob is clever and witty. We hope you will join us that night for an evening of laughs. We have fun! This passed week we welcomed several new volunteers to the Strand family. They are helping make our theater special, as it is what our community needs and deserves. Thank you for your support in everything we do. September will be a great month. See you at the Strand! “How did he do that?” We heard this phrase from almost all our patrons last Saturday night at Mat LaVore’s Mystery & Magic. Our volunteers can honestly say we have no idea how he accomplished the feats on stage. It was a very entertaining, thought provoking, and enjoyable evening. We didn’t know what to expect, and we are still having difficulty grasping what actually happened! We are in talks with having Mat return mid 2019. You will have to see for yourself. It defies description! Saturday night we welcome back KIT HAYMOND and PRESSED IN BLACK. Kit will be joined by first time Strand performer Trent Moss and the Fairland Ramblers. The concert starts at 7:30pm. Tickets are available at Mickey’s T-Mart or the band members. We will have plenty of tickets at the door. All tickets are $10. Just added: PULP FICTION – October 26,2018! We had a potential event that night, but the producer decided not to move forward. As such we had a prime Friday night in October. We turned to our de facto odd movie picker and said “what should we show.” Pulp Fiction was at the top of the list! It will be a fun (and quirky) evening! This week we worked on our sound equipment inventory. After 10 years, our equipment needed sorted, catalogued, and checked. We are most of the way through the project. We are very fortunate to have lots of equipment. We are pleased that we now have a complete serialized inventory of every cable. We use lots of cables! The concert this Saturday should be snap to set up with knowing what and where things are stored. Thank you to all the volunteers who helped with this project. Mainstreet Shelbyville awarded the Strand Theatre a facade grant for professional restoration of our second floor office windows. We uncovered and renovated them in 2008, but it was time to have a professional complete the job. The windows have functioned well, but they are no longer weather tight and have several areas of rot. Jim Wendle of Moscow Millworks will be removing and refurbishing the windows in the coming weeks. We are excited about this project. Once finished we will be able to FINALLY move into our offices! Thank you Mainstreet Shelbyville. The Strand has been a member of Mainstreet since we started in 2007. 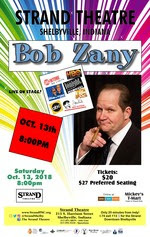 BOB ZANY COMEDY is returning to the Strand on October 13, 2018. He is funny! Tickets are $20. He is a clever and seasoned comedian. He is a staple on Bob & Tom and you will enjoy his show. We have a great time at the Strand. 2018 has many wonderful performances left. We hope you can attend. We do this all because of you, thank you. See you at the Strand!